I love cemeteries. I’ll occasionally drive to a cemetery, park my car and walk along the paved or dirt roads. There is something very peaceful about the setting. Perhaps its my way of escaping the busyness of life… or perhaps it is because I enjoy the resident company. As a Find-a-Grave photog volunteer I make it my mission to search out the hardest requests. It’s easy to walk among the stones and photograph those standing and I commend the hundreds of volunteers that do just that. 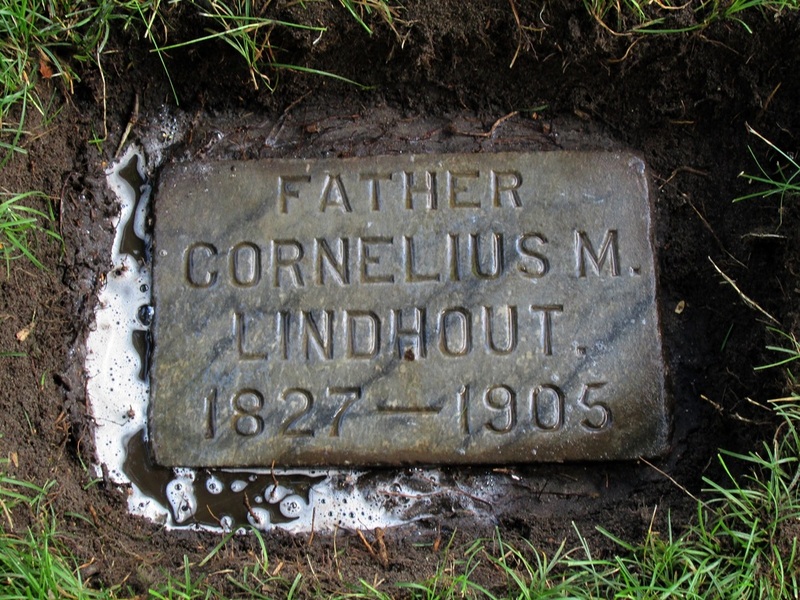 However, a trend I noticed on Find-a-Grave is to dismiss a grave as having no headstone when none is found. I know from experience that this is not always the case. I have literally found over 100 headstones, stones that toppled, sunk into the earth, and became covered with soil. At times these stones were nearly a foot below the ground. In modern burials we use a vault – a concrete enclosure wherein is placed and sealed the casket of our loved ones. The purpose of the vault is to keep the above ground level. Years ago, before the use of vaults, the casket would be lowered into the ground and covered with soil. The headstone would then be placed. What happens over time as moisture seeps into the earth, the wood casket will rot and its integrity will deteriorate and collapse due to the weight of the ground above. 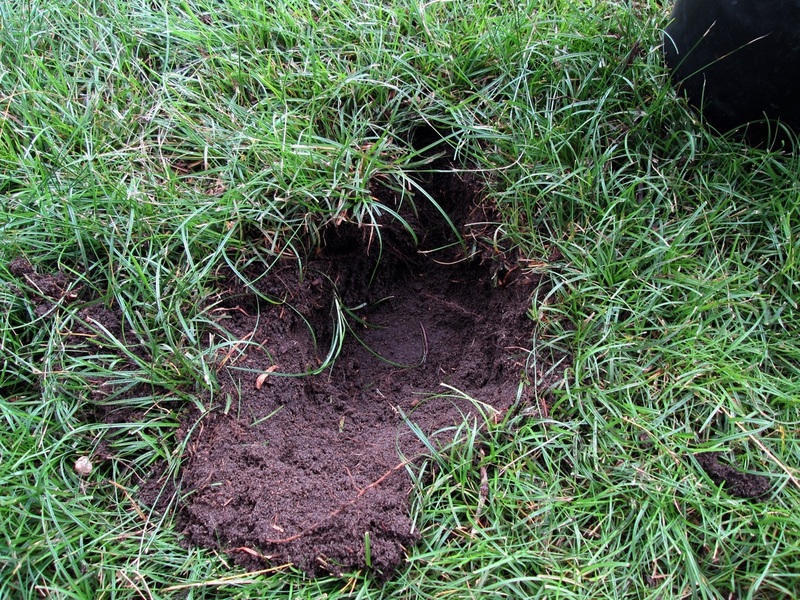 When this occurs the ground will shift down causing a depression in the soil making it easier for the headstone to fall within this depression. The depression will fill with blowing topsoil and debris and the headstone will become buried. 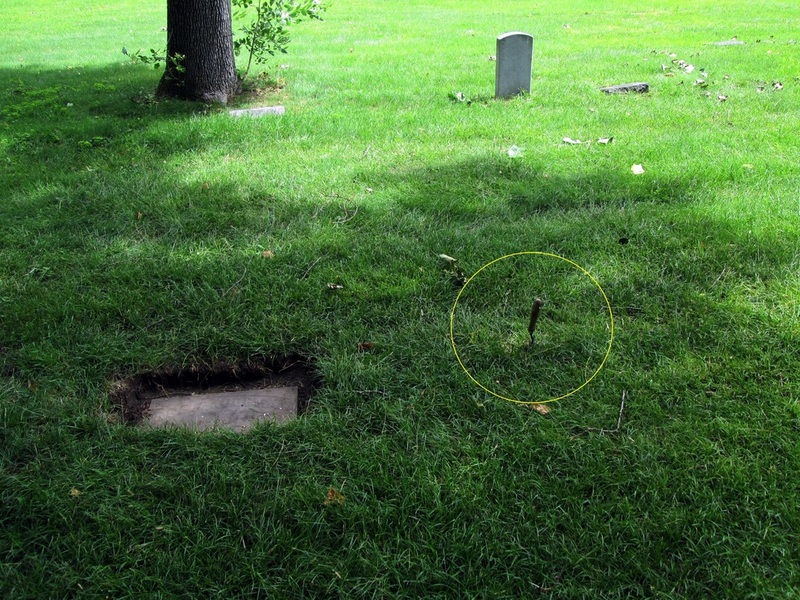 I arm myself with a long metal rod when searching for graves. It is about 4 foot long, is about 1/2 an inch thick, and is topped by a t-bar. Is this tool absolutely necessary to find lost graves? No. I have also used a standard two-prong weed puller. The purpose of whatever tool you decide upon is to penetrate the earth at least 6-10 inches deep in search of a buried headstone. 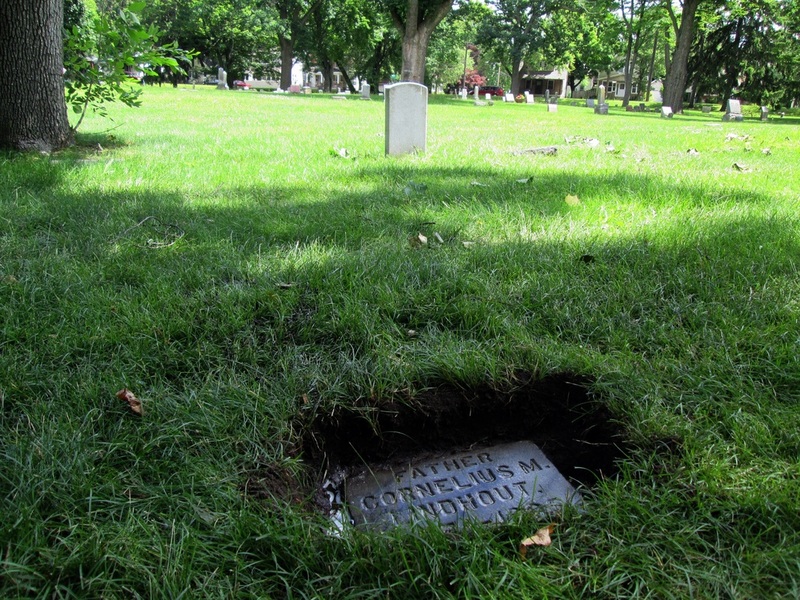 In the photo below you can see the ground as it appeared when a grave space was located. I gently probed the ground until I felt a thud. I have been mislead on occasion to unbury a pile of rocks so I now will probe 3 or 4 times around the same area to assure myself this is indeed a buried stone and to save myself from expending time and effort to unearth common rocks. It is important not to jab the earth with great force. Some of these headstones are quite fragile and could be broken via good intentions. So be careful. Once a buried stone has been found I use a garden trowel to search out the edges of the stone. 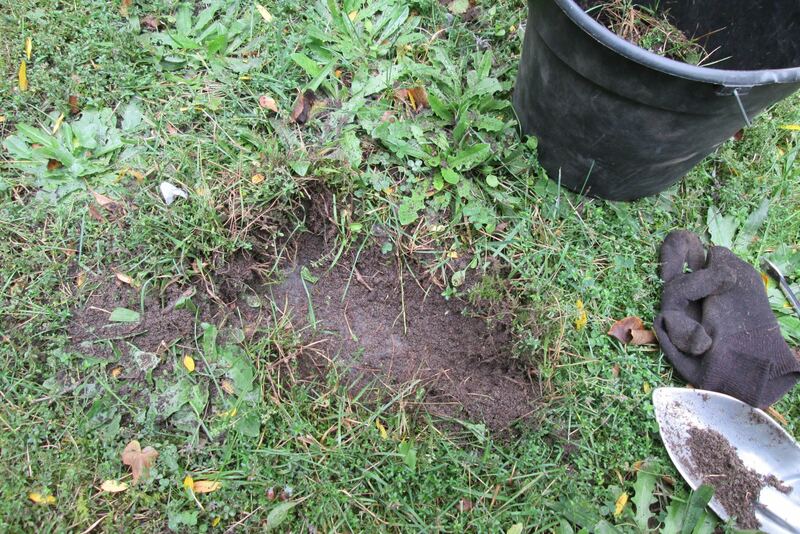 I scoop out the soil and place into a large bucket I bring for that purpose. Please don’t just throw the grass and soil over the other graves. I’ve seen where people have done that and it does not make for a pretty site. The purpose of the soil – as long as you have the cemetery’s permission – is to place beneath the stone as you gently raise her to the surface. I don’t recommend doing this without cemetery permission. And in most cases you may not have to. Check with local and State laws in your area. I have always sought out permission to both raise and/or unbury a headstone. I would hate to see someone get arrested for doing good. Yes, these headstones should be raised.. and no, a cemetery probably will never get around to doing so… but follow precautions. After removing the grass and soil to around an inch from the stone’s exterior I remove the rest of the soil and grass that might hinder my access to the stone. In other words I beautify the area through the removal of sod and grass that might grow over the stone in the near future. 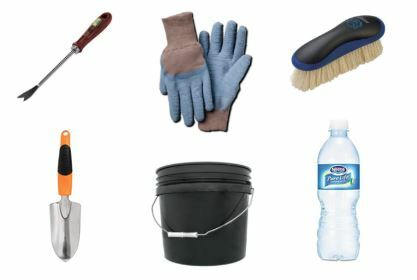 I bring a soft-bristled brush (nothing hard-bristled or with metal wires) to brush the remaining dirt from the stone’s surface. After being under the surface for so many years the stone is going to be encrusted with soil. Pour a bit of water on the surface and wash this off. It may take a few times to remove the soil but the reward is worth it. The water will fill the crevices of the letters making for a very legible inscription. Take your pad and paper and immediately write this down before the water dries. Take photos of the stone when wet. The inscription will be very visible. 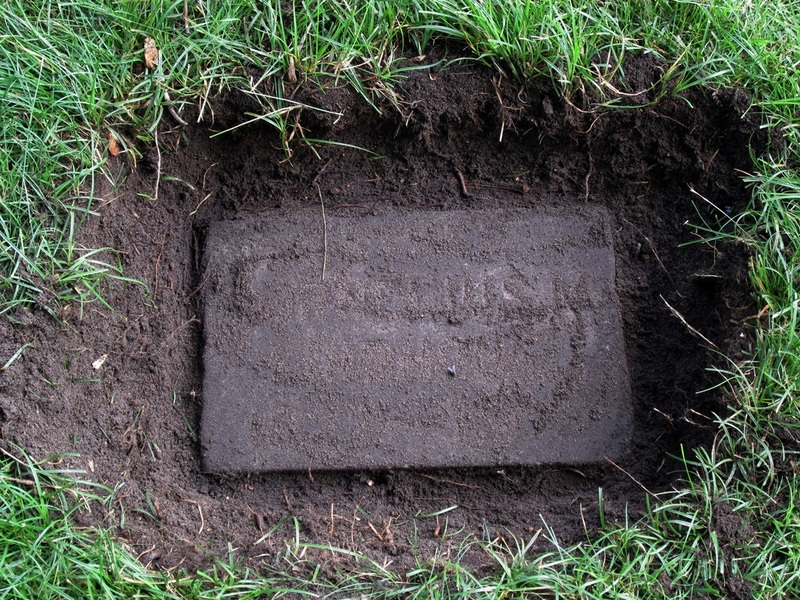 After the unburial (and possible raising of a stone) – be certain to post pictures to Find-a-Grave. I like to take several. I will take at least one of the stone itself when wet and then I will take a couple in perspective to adjacent stones being certain to encompass the area wherein the stone sits. This gives the viewer a nice visual making the stone easier to find. And most importantly… have fun with this! What a pleasure I receive from the unearthing of stones. And you will too. I want to thank you photogs that go the extra step in advance. You are doing the families of these buried ancestral stones a great favor. These headstones haven’t been seen in years. Thank you for your selfless service. Here are my governing rules that I tell other photogs who are interested in searching for hidden headstones. Rule No. 2 – Don’t damage the stone. I can’t emphasize that enough. It is imperative that you don’t do any harm to the headstone. Treat each case as if the stone were extremely fragile. That means don’t use hard-bristled brushes or prod the earth with heavy thrusts. Be gentle. Rule No. 3 – Have fun!